As they prepare to head out on their first extended road trip of the season this week, Coach Jason Kidd and his Brooklyn Nets took a special trip on Monday to spend some time with Armed Forces members in Brooklyn for Veterans Day. The Nets held their daily practice on Monday at Fort Hamilton Army Base in front of approximately 300 service men and women. Following the practice, the Nets went to work in the cafeteria, where they served lunch to those who serve the United States. The event was organized by the Nets with the help of Air Force technical sergeant Derek Bishop, who lauded the franchise for the gesture. 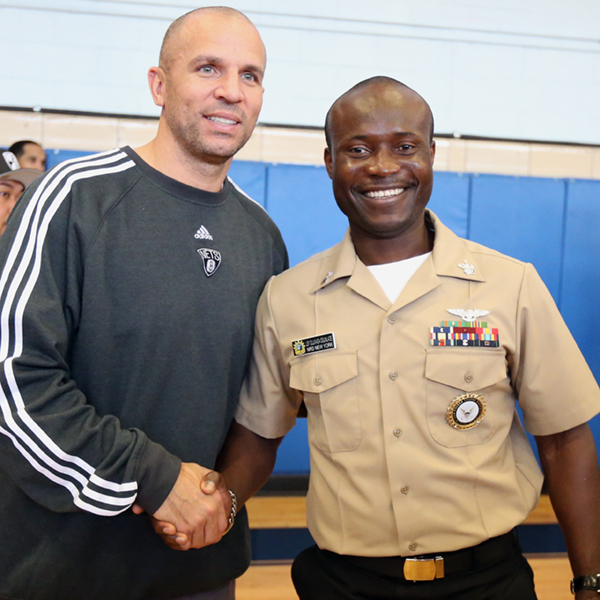 Coach Kidd, whose father was an Air Force mechanic, said that he and his team relished the opportunity to give back to the Brooklyn-based soldiers.